3/4 lb. deli ham – I used the store-cooked type that has a milder flavor and is less processed. Chop the sliced ham into 1/2″ square bits or smaller. Fry the ham with the butter in a large skillet uncovered until nicely cooked – maybe a few bits here and there are browned. Next, pour in the frozen spinach. I bang on the bag with my fists before opening to break up frozen chunks. Now mix them together and cover. set the heat to low and give it a few minutes for the spinach to melt and add liquid to the pan. Once the spinach is thawed and begins to cook, place the cheese slices on the top and as the cheese melts, blend it into the mixture. Next, toss in the almond flour. I don’t think it’s absolutely necessary, but it didn’t seem to hurt, either. The melted cheese and the liquid from the spinach gave the mixture a creamy sauce, which is why I call it ‘cream’ spinach. The cheddar cheese almost overpowered the dish, so don’t overdo it. So…we don’t know what to do, but we need to take action?!? Isn’t that putting the cart before the horse? What seems to go forgotten in this article is that we have been fighting obesity for the past 50 years – go down the aisle of any grocery store and count the number of low-fat, low calorie products – you might not be able to keep count. Western culture is obsessed with obesity. How many people do you know are on a diet? How many people do you know that don’t need to be on a diet are on a diet? Oh – by the way – if the good doctor paraphrased above hadn’t noticed – the polar ice caps are still melting. Maybe we don’t want to tackle obesity in the same fashion? And…the article goes on to tell us something only a scientist could tell us and make it sound like a solemn learned observation: children are born small. Apparently, this researcher works at the Institute for the Frigging Obvious. Maybe I’m being too hard on the article. It goes on to mention a drive for better product labeling – nothing wrong with that, but the ‘traffic light’ labels wouldn’t help somebody following a low carb lifestyle as there’s no mention of carbohydrates – I guess because they’re so darn good for us. Or is ‘sugar’ and carbs the same thing in the EU? I guess their food labeling does little to clue me in. Lastly, they talk to an American researcher that provides the same old song and dance that we’ve heard for 50 years – cut calories and exercise for 60 to 90 minutes. Problem is – there’s no proof exercise leads to weight loss – and it makes you hungry to boot. I’m not going to put down exercise – I wish I did more myself – but I lost 80 lbs without doing any, so that proves that maybe exercise as a means to weight loss isn’t a requirement for everybody. Nothing much happened today, in our opinion, so surf someplace else. I mean, they have to write something. I guess this is something. The sad fact is – if this is the kind of quality health journalism the public receives, the public will continue to get fat and stay fat. NOTE: all measurements here are guesses – I just tossed in the stuff – feel free to adjust. My general approach was to make the spinach ‘creamy’, coat the top with cheese, and put in my Hummer of a toaster oven, so first I took the ricotta cheese and mixed it with the olive oil and garlic. It made a nice goo which I poured over the spinach. The spinach I prepared by placing in a square oven-safe baking dish, nuking for 5 minutes, then draining. I hate the act of squeezing out the water in spinach, and found that if I use my big rectangular butcher knife, and sandwiched the spinach against one side of the dish and compressed, it worked very well to squeeze the excess water out of the stuff. No muss, no fuss – and no extra dish. I mixed the spinach with the ricotta / oil / garlic goo and evened out in my pan. I turned on my toaster oven (actually a convection oven – it makes horrible toast) and set it to broil. Then I sprinkled the almonds evenly on the top of the spinach. I then grated the remaining two cheeses and spread evenly on the top. I then put it in the oven for 15 minutes. THE VERDICT: 15 minutes was a bit too long – the cheese became crusty instead of gooey, and the spinach could have used a bit of salt in the ricotta, but it was actually quite good, and relatively easy to make. Two members of the Low Carb Confidential Taste Panel enjoyed the crust and was eating it off the top of the dish until I shooed them away. This one is safe for induction and another way to get your veggies. UPDATE: I had this for breakfast and the flavors had melded nicely. I will most definitely make this again. The sesame oil can be tough to find. You can usually find it in specialty food stores, well-stocked supermarkets (check the ‘International Foods’ aisle) or in an Asian market – you will always find it in the last one because Asians are smart and include this flavorful oil in a lot of dishes. Anyway, slice the cucumber in blocks – I cut it into 4 spears, then chop those about 1/2″ thick. Pour on some sesame oil and soy sauce to taste. A great induction side dish and a great way to get your veggies. If you read my other post about scales, you know the jury was still out on the ConAir “Weight Watchers” branded one I bought a few weeks ago to replace “Ol’ Red.” Sorry to say, the ConAir went back to the store on Sunday. Too many days went by that left me guessing about what I really weighed. The difference among a number of trials each morning could vary as much as 1.3 pounds.I was now intent on getting a Tanita, which was my first desire when I went shopping in January after reading the ‘reviews of the reviews’ on ConsumerSearch.com. Bed Bath & Beyond carried two of their many models: a glass plate number for $100 that had many more features than I needed, and the model that was regarded in the above mentioned review as the most reliable and the most consistent: BF-679W. It was a mere $50, much less than I’d paid for the ConAir, and I had a 20% coupon bringing it down to $40. Pretty darn reasonable. The BF-679W isn’t a beauty prize winner. It’s pretty standard bathroom scale fare, and I’d say it looks and feels a lot like “Ol’ Red” with a silver paint job and a display makeover. Our bathroom has brushed nickel accents, so it fits in okay, unpretty as it is compared to most of its peers. It sports some diamond-shaped silver plates for the electric pulse necessary to measure body fat and water, and the only other adornments are three small buttons below the display for setup, and three toe-kick buttons on the lower end to start it up. A switch on the bottom of the unit lets you pick whether you want the readout in pounds, kilograms, or lb/stone. Four AA batteries are included. 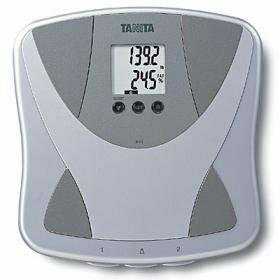 The scale has a maximum capacity of 300 pounds, and the display measures in 0.2 pound increments of weight and 0.5% increments of body fat. The scale is easy to program, as was the ConAir. There’s memory for two persons, and it has a “guest” mode so visitors can check their weight along with the other optional measurements. For each regular user, you use the set-up buttons to indicate age, gender, and height. Once that data is in, each user simply taps with their toe their assigned button on the lower edge to start; their data is displayed followed by a zero weight reading and a beep to indicate ready to weigh. The user steps on the scale, minding that their feet touch the metal plates (long footed people can overhang the front if necessary). The scale shows a countdown readout from 5 to 1 while it makes the measurements and, voila, displays the weight, below which either the body fat percentage and body water percentage are shown, trading places for several seconds even after the user steps off. With the push of one of the buttons below the display, you can recall your previous weight and the associated difference. There is a center toe-kick button so that weight-only measurements can be taken that do not utilize the current pulse feature (important if you have a pacemaker or such, or are pregnant). I did an accuracy check when I set it up, as I did with the ConAir. I put a towel on the scale and placed a 35 pound Olympic plate from my home gym on it. The ConAir weighed the plate and towel at 35.2 pounds. The Tanita weighed them at 36.0 pounds. While I normally would expect a 35 pound plate to weigh exactly 35 pounds, giving more credence to the ConAir for accuracy, I’d assume there must be some allowance for error in manufacturing such pieces of iron; 0.8 pounds is only 2.2% of the plate’s supposed weight. Also, I did not make repeated trials of weighing the plate on the ConAir because I did not know at that time the readouts were inconsistent; perhaps a subsequent trial or two would have seen the plate and towel weigh 36 pounds (the ConAir typically would weigh low on first trials). In any event, without the ability to test this clinically, I will assume the Tanita is correct (or more correct than the ConAir) by virtue of other reviews attesting to its accuracy. So how has it performed in the last five days? I weighed myself each morning upon waking, sans clothing and post-evacuation. I went through the same series of three or four trials as with the ConAir, some with weight-only, some with body fat measured. The most fluctuation I could see was in the least significant digit, which can be taken as the scale simply trying to choose a number closest to the two-tenths to which its display accuracy is limited. The body fat and body hydration readings were either identical to or nearly identical to those readings I’d seen on the ConAir (32% body fat, 48-49% water). I’m satisfied with the consistency of this model and would recommend it heartily. If your performance concerns are the same as mine and you don’t mind a pedestrian-looking appliance in your bathroom, this is an economical choice I believe you can count on. Does The Government Want Us Fat to Save Money? Here’s a little conspiracy theory for you. I don’t believe in conspiracy theories (most times), and I don’t believe this one (at least not yet), but they’re fun. I came across an article that essentially says that smokers and the obese are cheaper to care for – the study shows that fat folks and smokers do society a big favor by kicking the bucket early – avoiding those long, drawn out diseases of old age like Alzheimer’s – which cost a lot in terms of medical care. So…that means that it’s good for society from a cost standpoint for us to be fat and die early. Now you know why they call economics ‘the dismal science’. It’s only a small leap to see that if the government wants to cut costs, keeping people fat would help. So that leads to the conspiracy theory: the government wants us fat so we will die in the prime of life, and relatively suddenly, so that we don’t burden the system. To facilitate this, it pushes a diet that makes us fat – while telling us it makes us thin – and helps guide us down a path to our early demise. Total rubbish – I know. Like I said: conspiracy theories are fun, but they’re just not real – things like that just don’t happen. Is the Tide Turning on Low Carb? Maybe it’s me. I’m well aware that most of us are quite good at fooling ourselves. I believe that we are all delusional, so it is wise to choose delusions for yourself that make you happy rather than sad. Am I delusional to say that it seems that the tide is turning on low carb, and that more and more, mainstream science and the media are beginning to embrace some of the notions that labeled Atkins a dangerous quack only a few years ago? In psychology there is something known as a ‘confirmation bias’ – the tendency to search for or interpret information in a way that confirms one’s preconceptions. See Wikipedia for a list of cognitive biases and check out which ones you see yourself in – enlightening. Maybe it’s this confirmation bias that I’m suffering from, or maybe it’s true that more and more people seem to seem to be embracing many of the notions that form the basis of a low carb lifestyle – maybe not as aggressively as Atkins did, but it’s moving in that direction. An article in the mainstream media titled ‘What if Bad Fat Isn’t So Bad?‘ where the author point out that there has never been an established relationship between saturated fat to heart disease. Old news for the low carbers who have educated themselves on the scientific evidence, but it is somewhat remarkable to see this out in the mainstream media where it contradicts their regular nutrition articles touting low calorie and low fat diets. The ADA has (almost reluctantly, it seems) come out endorsing a low carb diet as helpful in diabetes management. It’s tough to admit you were wrong so I give them credit for taking even some small steps in the right direction (See list of cognitive biases above to determine which one they’ve been suffering from). I was reading a recipe for a smoothie that was endorsed by the ADA as good for diabetics – 40 grams of carbs. That’s more than I try to have in a normal day – not in one drink. Gary Taubs and the publication of his book ‘Good Calories, Bad Calories‘. In this book, the author makes a solid and very well researched argument that good science was essentially hijacked by a number of people with an axe to grind and 50 years of screaming about fat being bad for you is nonsense. What kicks this up a notch is that he’s gotten a lot of PR – heck – he was on Larry King, for instance. Maybe the Atkins craze of 2003 was just a first battle in war that isn’t lost just yet. The problem with the craze was it’s lack of depth. Docs almost universally poo-poo’d it, a bunch of companies came out with crappy low carb products, and millions of people ate nothing but burgers, steaks, butter, bacon and eggs without a real understanding of how low carb works, thinking they could lose their 20 lbs, then go back to cookies and pizza and not have a problem. When they did, they claimed that Atkins didn’t work. Or they ate the low carb crap food, didn’t lose weight, and claimed Atkins didn’t work. Or they never explored outside the narrow little world of steak and eggs, cheated because of that, and claimed Atkins was too hard. The craze of 2003 spawned a lot of research, and the results of this are beginning to come in. Combine this with Gary Taub’s book, and it shows that low carb dieting is not just the wacky idea of a single quack doctor with a best-selling diet book (which is how it appeared to me in 2003), but a theory that has a lot of evidence to support it, as well as a long history of empirical success in the history of medicine. The jury is still out, however. the problem with this sort of research is it is like the peeling of an onion. Each layer reveals more, and helps to confound the assumptions and conclusions of the previous knowledge we once thought to be immutable. A simple fact that is known is that with 50 years of low fat messaging to the American public, and a overall reduction in the consumption of saturated fat – the demonized nutrient that supposedly causes heart disease – and the rise in carbohydrates eaten, our rates of diabetes and heart disease have skyrocketed. This fact has doctors a bit more open it seems, to the notion that low carb might not be all that bad as an alternative to low fat, because the low fat approach is not doing most of their patients any good. So, perhaps the tide is turning?